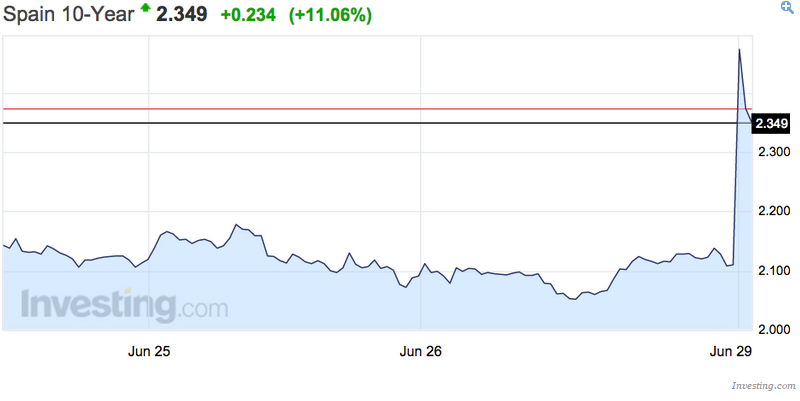 Spain’s 10-year bond yield jumped 14 basis points to 2.25 percent, set for the biggest increase since June 15. The yield on Italian 10-year bonds climbed 14 basis points to 2.29 percent, having earlier surged as much as 57 basis points. The Greeks will vote next week to stay in the Eurozone. If that quells bond markets, it may avert a collapse for a while. If it doesn’t, then this is the end game. Unless China keeps crashing and bringing down other markets with it anyway. China is down another 3.5% today. ← What Happens When Greece Can No Longer Pay Riot Police?